Oh no! Your toilet is overflowing? What can you do to mitigate the damage and get everything repaired as soon as possible? Call Lightfoot! We are the plumbers that so many people in Granbury, TX are talking about. We’re experienced and skilled, and we also put customer service at the top of our list of priorities. So many people in Granbury have already been happy with our work that we feel like you will be, too. Give us a chance and let us show you how we can fix your toilet problem quickly and efficiently, all while keeping your budget in mind. Some toilet problems are obvious, but others can be harder to spot. If you’re not sure whether something is wrong with yours, look for some of these things. And if you see these signs, give us a call. Your toilet runs all the time. Your toilet overflows without an obvious cause. You have to jiggle the handle to get your toilet to stop running. You have water pooling around the bottom of the toilet. Your toilet makes odd sounds. A bad odor emanates from your toilet. The water pressure in your toilet seems low. When you give us a call, we’ll make sure, first, that it isn’t an emergency. If it is, our operators can talk you through turning off the water to your toilet or, if that doesn’t work, turning off the water to your house.This helps lower the amount of damage that an overflowing or constantly running toilet can do. Since water damage can mean replacing walls, floors, furniture, and more, this is an important way that we take care of you. Once we know that the water is off, we’ll set up a time for a plumber to come by. 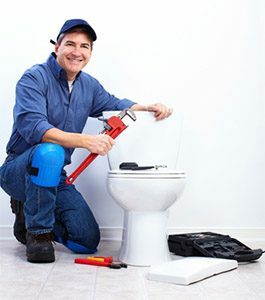 A trusted plumber in Grandbury TX will show up on time, examine your toilet, and let you know what needs to be done to get it fixed. If it turns out that you need to replace your toilet, we’ll let you know. Sometimes, it’s cheaper to do that than it is to perform the repair. We’ll walk you through the whole process, from choosing a new toilet to ordering it, getting it delivered, and installing it. We’ll give you several toilets to choose from, or you can go out and look for yourself. Once you have your toilet, we’ll handle everything. And we’ll make sure that you get to try it out for yourself before we leave! Nobody loves to call the plumber for a toilet repair. If you have to call, though, call Lightfoot. We are the plumbers who strive to make you happy and to get you and your family back to your normal lives just as soon as we possibly can. We work hard to remove the stress of plumbing repairs from you, so you can relax while we get the job done.